The primitive multistrut monoplane patrol boats produced by Consolidated and Martin in the late 1920's and early 1930's have been mentioned earlier. Fortunately, under the impetus of encouragement in  the form of small contracts, both companies continued to develop improved forms of patrol boats during the period 1930-1940. Consequently, when war came to the United States in December 1941, the Navy had in hand two excellent twin-engine patrol boats as well as a new four-engine flying boat. By any measure, the Consolidated PBY Catalina was the most successful patrol boat ever built. First flown in March 1935, 2398 Catalinas were built in this country, and a number were constructed under license in other countries, including Russia. In addition to the United States forces, British, Canadian, French, Australian, and Dutch forces used the PBY in World War II. After the war's end in 1945, the aircraft continued to be used by various military forces in different parts of the world, and a 22-passenger version was in use as an airliner in South America. Even today, a few Catalinas may be found employed in different activities. Certainly, the aircraft has been used, at one time or another, for every purpose for which a flying boat might be used - and perhaps a few never dreamed of by the designers. The PBY was initially designed and produced as a pure flying boat; however, two later versions were amphibians. One of these, a PBY-5A, is depicted in figure 8.20. Although descended from the PY-1 and Commodore series of aircraft, the PBY family bore little resemblance to these earlier flying boats. As can be seen from the photograph, the semicantilever monoplane wing with engines mounted in the leading edge was positioned a short distance above the hull on a streamlined pylon. Two short struts on either side of the hull helped support the wing and engines. The hull itself had a single transverse step with an afterbody tapering to a sharp, vertical stern post. No means of lateral stabilization is evident in the photograph since the floats used for this purpose were retractable and formed part of the wingtip in the stowed position. They were, of course, extended only when the aircraft operated from the water. Controllable-pitch propellers were used, but the aircraft had no flaps, which accounted for the relatively high estimated stalling speed of 79 miles per hour. Innovative is a word that might justifiably be used to describe the configuration of the PBY series of aircraft. The values of CD,O and (L/D) max. of 0.0309 and 11.9 indicate a relatively aerodynamically clean flying boat for its time. The maximum and cruising speed of 179 and 117 miles per hour were not particularly fast but were satisfactory for a World War II patrol boat. The Catalina was of all-metal construction except for the trailing-edge portion of the wing and the control surfaces, which were covered with fabric. Accommodations in the Catalina provided for a gunner located in the nose, side-by-side seating for the pilot and copilot behind the nose gunner, a navigator/radio station behind the pilots, and a flight engineer's station located in the pylon supporting the wing. Figure 8.20 shows a small window in the pylon for use by the flight engineer. Located in the hull behind the wing were two gunners in transparent blisters on either side of the aircraft. Some aircraft also had a gun that could be fired downward and to the rear through an inclined tunnel that opened on the bottom behind the stern post of the hull. For offensive operations, the PBY-5A could carry either 2000 pounds of bombs, two torpedoes, or four 325-pound depth charges. The range of the aircraft, of course, varied with the payload. For purely patrol operations without any bombs, etc., the range given in reference 118 is 2545 miles. Surely, the Catalina must rank as one of the great flying boats of all time. With the great clarity afforded by 20-20 hindsight, questions are sometimes raised as to whether a particular aircraft should have been developed at all, not necessarily because the aircraft considered as a flying machine was inferior but because of flaws in the operational concepts that engendered its development. Such questions surround the only four-engine patrol boat operated by the United States in World War II, the Consolidated PB2Y Coronado series of aircraft. A 1936 Navy requirement for a long-range, four-engine patrol boat capable of carrying a greater payload than the PBY was responsible for  the Coronado family of aircraft. 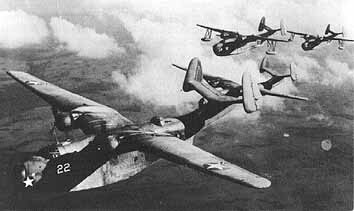 The prototype first flew in December 1937; a later version of the aircraft, the PB2Y-2, is depicted in figure 8.21, and physical and performance characteristics of the PB2Y-3 may be found in table IV. In configuration concept, the PB2Y was similar in many respects to the Boeing 314 (fig. 8.16) with the wing positioned on top of the deep, large-volume hull and the four radial air-cooled engines mounted in the wing leading edge, two on either side of the hull. In contrast to the sponsons used for lateral stabilization of the Boeing 314, however, the PB2Y had retractable wingtip floats similar to those on the Catalina. These floats and their supporting struts are clearly visible in figure 8.21, as are details of the bottom of the single transverse step hull. Although wheels are visible in the photograph, these were used only for beaching and ground handling. The aircraft was not an amphibian. The PB2Y was a thoroughly modern aircraft for its day and featured all-metal construction, trailing-edge flaps, controllable-pitch propellers, and engines equipped with two-stage superchargers for high-altitude operation. ...Boeing, however, was 23 percent heavier, had more wing area and thus more drag area, and more power than the Consolidated boat. Both aircraft first flew with a single vertical fin and shared a common aerodynamic problem. In their initial form, both the 314 and the PB2Y had insufficient lateral-directional stability, no doubt caused by the large side area of the deep hull forward of the center of gravity. Boeing solved the problem by adding two additional fins, one on either side of the original center fin, near the tips of the horizontal stabilizer (fig. 8.16). The Consolidated solution consisted of eliminating the center fin and placing large vertical surfaces at the tip of each side of the horizontal tail and introducing a small amount of dihedral in the horizontal surfaces. Although great progress had been made during the 1930's in achieving an understanding of the science and art of aerodynamics, the lateral-directional problems of the Boeing and Consolidated boats clearly showed that more was yet to be learned. As an instrument of war, the PB2Y could carry 12 000 pounds of bombs, had eight machine guns, six of them in pairs of two located in power-operated turrets, and was equipped with self-sealing fuel tanks and a certain amount of armour plate. It had a maximum ferry range of 3120 miles and could carry 8000 pounds of bombs for a distance of 1380 miles. Although the Coronado seemed to have considerable potential as a patrol bomber, it saw little operational use in this role. The basic problem was one of cost effectiveness. A Coronado cost three times as much as a Catalina. Yet it is doubtful that a single Coronado could effectively patrol as large an ocean area as three Catalinas or whether the one large aircraft could attack a single surface target with as high a probability of success as three of the smaller boats. Questions such as these limited the operational use of the PB2Y as a weapon of war. As a consequence, most Coronados were used in freight or passenger/carrying roles and all were retired from the Navy by the end of 1945. Total production of all versions of the aircraft was only 217. The Coronado is an illustration of how a basically good aircraft was little used because of faulty assumptions in the formulation of the basic requirements for the aircraft. In the years of World War II, a worthy stablemate of the workhorse Catalina was the Martin PBM Mariner series of patrol boats. The prototype made its initial flight in December 1939; before production ended 10 years later, 1360 examples of the Mariner, including many different versions, had been constructed. The last Mariner was retired from the U.S. Navy in 1958. Four different Mariners are depicted in figure 8.22, and a PBM-3D was used in figure 8.1 to illustrate certain general features of flying-boat design. Early versions of the PBM incorporated retractable tip floats similar in concept to those employed on the PBY and the PB2Y. Because of difficulties experienced with them, however, all versions of the Mariner beginning with the PBM-3 were equipped with fixed, tip-mounted floats. The two aircraft in the foreground of figure 8.22 had retractable floats, and those in the background were later versions of the aircraft with fixed floats. Perhaps the most unusual feature of the PBM configuration was the gull shape of the full cantilever wing, with the engines located at the juncture of the wing break on either side of the hull. This particular wing-engine arrangement was intended to minimize spray passage through the propellers and, together with the relatively deep hull, served as an alternate to the shallow hull and pylon wing mounting of the PBY. Another distinctive feature of the Mariner configuration was the two vertical-tail surfaces mounted at the tips of the horizontal tail. And like the PB2Y, dihedral was incorporated in the horizontal surface. This particular empennage design probably gave improved directional control with one failed engine, as compared with a single fin configuration,  and assisted in minimizing spray impingement on the tail. Of modern all-metal construction, the PBM also had trailing-edge flaps and controllable-pitch propellers. Although most versions of the Mariner were pure flying boats, a few were completed as amphibians in 1948 and 1949. A number of transport versions were also built. A comparison of the data in table IV shows that the PBM-3D was a larger aircraft than the PBY-5A. For example, the Mariner was 52 percent heavier and had 58 percent more power than the Catalina, but the two aircraft had about the same wing and drag areas. As would be expected, both the maximum and cruising speeds of the Mariner were somewhat higher than those of the Catalina, as was the value of the maximum lift-drag ratio. The PBM-3D had eight .50-caliber machine guns and 1058 pounds of defensive armament and could carry either bombs or depth charges housed behind the engines in lengthened nacelles in the PBM-3D and later versions of the Mariner. A total of eight 325-pound depth charges could be carried. The range potential of the aircraft varied with the payload. For example, the ferry range with no payload was 3000 miles, and with four 325-pound depth charges, the aircraft was capable of a range of 2580 miles. Like all highly successful aircraft, the Mariner was produced in many versions, with different engines, different equipment, and different capabilities. The data in table IV are for only one version, the PBM-3D. Complete descriptions of the various versions of the Mariner, as well as the Catalina and the Coronado, may be found n references 64, 109, and 118.